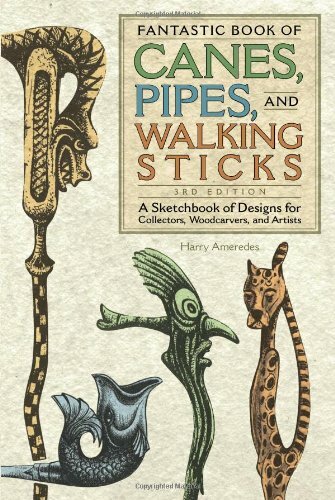 Walking sticks and canes are popular, yet easy items to carve. There are several common carvings done on walking sticks, but there is nothing to stop you from carving whatever you wish. This a partial look at a feature I put on my website in February 2002 to kind of test the response for a "how to" CD I was in the process of developing. I was overwhelmed with the response and have since developed several "how to" CDs. I collect the "dead" ones when I find them and have made a shoulder harness to carry them in the bush. As to the "live" ones, I collect them only between May 15 and July 15 because during that period the sap is running and they are very easy to peel. Other times of the year, I mark the green ones with ribbons, to collect them later. Cane carving can be one of the most expressive areas of our hobby. Just about everything conceivable has been carved on a walking stick, from snakes to nudes, Biblical passages to dancing clowns. Working with either a well seasoned stick or a cut blank, carving canes will bring hours of pleasure, with the wonderful reward of a finished walking stick when you are done. There are a lot of woods that work well for making walking sticks or canes. Here are just a few: maple, alder, cherry, diamond willow, aspen, sassafras, and even Ocatillo Cactus or walking stick cabbage. They all can be peeled, carved or burned. One hundred years ago, the north shore of Lake Superior was overrun with fisherman throwing out large nets and pulling up lake herring by the ton. These rugged men lived a hard life, pulling in their nets from the great lake. Now and then, one of the nets broke loose and the floats that held the net up, Photo 1, were set adrift-to be collected later as they washed ashore. I now hold one of those floats in my hand, and with the guidance of a seasoned carver, instructor Bruce Futterer, I will bring out that fisherman's face and bring the wood spirit to life.